A Place or A Way to Live? Over the summer I watched on DVD a mini-series called “Into the West”. In one of the early episodes, a young Jacob Wheeler has left the safety of hearth and home to follow a group of mountain men led by the famous (and historical figure) Jedediah Smith to exploring the uncharted west. That maxim leads the young Wheeler to a life of conviction and integrity. A life that differentiated him from so many of the mountain men with whom he shared company. A particularly powerful moment comes when a young Lakota woman is being sold like meat for consumption; he duels for her and protects her, marrying her instead of exploiting her. Throughout the summer as I traveled to many different places I observed that most of us have also confused our places and our lives. I have seen this with beach cultures and mountain towns, in poor villages and wealthy enclaves. We are so easily influenced by the culture around us that the place becomes the way to live. This is just a place on the map, not a way to live. So many of us confuse where we are with who we are. We are chameleons who take on our environment, our culture, and the world around us and are convinced that it won’t harm our souls. We believe the lie that “What happens in Vegas stays in Vegas,” when the truth is that what we do, wherever we are, shapes who we are. In many ways, we Christians, fall into the same trap. We often believe that the “Kingdom of heaven” is nothing but a “place” on a spiritual map that we hope to go to when we die and not a “way to live”. We read passages that refer to us as “citizens of heaven” (Phil 3:20) and think that it refers only to the afterlife. But it is actually a calling—a way to live—not an address. N.T. Wright has pointed out that the imagery of citizens of heaven was a reference to those ex-patriots (most of the retired Roman soldiers) who were rewarded with land grants and asked to populate the conquered territories at a distance from Rome. These “citizens of Rome” knew that while they lived in far off lands like Philippi and Ephesus, they were to be loyal to Rome and by their influence help turn this territory into Roman stronghold. While the “place” they lived in was a foreign land, the “way” to live was as a Roman. My friends, we Christians must get clear that as Christians, the Kingdom of heaven—life under God’s reign and rule—is the way to live in whatever “place” we are called or find ourselves. And if the church is going to be, again in the words of Bishop Wright, the “place” where “heaven and earth overlap” and then that “place” will only become evident by the "way" we live. "You Were Loved into Existence"
It didn’t occur in the middle of a worship service, but at the Ironman Pre-Race dinner. And it didn’t come from an eloquent preacher, but from a humble Catholic sister. You were loved into existence. I looked at Charlie and we both had tears in our eyes. 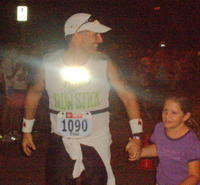 While out on the Marathon run in the Ironman, I was more aware than ever that I was loved into existence. I was running with one of my best friends, in a beautiful place, doing something that I barely dreamed I could do. I was running into the arms of my family who loves me and cheers me on in all the crazy things I do. I was running with the prayers and support of my friends back home, a couple who had even called me on my cell phone to assure me of their prayers for me, others who had emailed or posted on my blog to let me know that they were thinking of me. I thought back to all that I had experienced in these past three months and all that I have experienced being at San Clemente Presbyterian Church these past nine years (I had plenty of time to think about all of this—it’s a long run!). I found myself well up with tears again because without question, I could say that I know that I was loved into existence. And without even intending to do so, I found myself thinking and praying for others. I prayed for the people around me, some of whom live for little more than physical fitness. My mind wandered back to so many people I had met along the way the last couple of years. Do our friends in Malawi know that they were loved into existence? Do they know, O Lord, that you loved them into existence? My prayer as this sabbatical season comes to an end is that I can so communicate to my church the presence of the Father who loved us into existence, that we, anchored in that confidence, will become more and more a part of the Father’s mission to make right the world that he "so loved into existence." Stay tuned as we try to figure out exactly how we are called to do that. Lessons from Tri-ing Part 6: If you compete, you lose. Friend-and-personal-tri-guru, Ted, tells the story of being in the big pre-race meeting at Ironman Coeur d’Alene and the race director asking the crowd of 2000 Ironman competitors this question. Half a dozen guys raised their hands. “Okay," he said, "you guys listen to these race instructions, everybody else…follow them!” The crowd roared in laughter. I “lost” the time goal, but won so much more. Which leads me to my next lesson for both triathlons and life: If you compete, you lose. It was the first hard lesson that I had to learn. If I tried to run with the guy trying to pass me, stay with the cyclist trying to drop me, hang with the swimmers who effortlessly stroke away from me, I will most likely end up "blowing up" and will have to stop the race. The only thing I really had to worry about was whether my competitive nature would make me lose out on all that I was training for. On the way home from the Philippines I read the recent Business Week issue on “competition”. Indeed, the front cover blared teaser headlines about how the “competitive gene” is alive and well in American business…well, kind of. In story after story, the emphasis was shifting. Competition is more about doing your best in all of life, not being the best at one thing. We may (deservedly) laud riches and accolades on the Lance Armstrongs of the world, but in truth we want to be good at what we do AND have a good marriage AND a good relationship with our family AND some other meaningful pursuits in life. Many of us know all too well, that you can “win” at work and lose in life. The problem is NOT striving for “excellence” but instead striving to WIN, to beat others, to secure the spoils of life just for ourselves. But, I must quickly add—and this is such a trap for triathletes or anyone else who has been dedicated in the pursuit of a big goal—many of us are in constant competition with a foe we will never, ever, ever defeat: our idealized self. No matter how well we do; we almost pride ourselves on demanding more of ourselves. Our internal voices are the harshest coaches and before long, the very activities and accomplishments that we undertake for the joy of it, become another way in which we are just not measuring up. Instead of excellence, we seek perfection. Instead of enjoying learning, stretching and growing as a person, we berate ourselves for how far we still have to go. My wife and kids observed at the Ironman that the slower a person’s time, the happier was their face, the more they were relishing in the accomplishment, the more they seemed to be enjoying themselves. And the faster, the more gifted, the more fit and accomplished a person was, the more uptight and self-absorbed, surly and miserable they seemed. The joy of an event that was dreamed up 30 years ago by a bunch of people who just wanted to see if they could do it, was lost in "split times" and attempts to “qualify for Kona” or whatever "winning" meant to them. In so many ways, I see the same thing happening in the church. While we may never admit it, many pastors have lost the joy of doing something that is just an amazing privilege. We put pressure on ourselves to have the biggest church, to become a notable speaker or respected leader. We want to be consultants or teachers who are in demand, we want our ministries to be admired by others. What is interesting, however, is how much more the church cares that we are just faithful pastors who love and lead them well. They cheer us on for even running the race and accepting the mantle of leadership. They are just glad that we don’t give up. "The One With the Biggest Smile Wins"
My friend Chris always says that when you are out running a marathon or doing something like an Ironman, the key is to remember that this is all a gift. Says Chris, "The one with the biggest smile wins." Beth's reminder as I left at 5 AM was similar, "Keep smiling, honey." So I did. For just over 14 hours I smiled my way through Ironman Canada. It was a really great day. Today I got a massage, ate some french fries and took the kids Jet-skiing. Charlie, who finished in 14:45, and I enjoyed hearing from so many of our friends who were tracking us online. "Team Glowstick" had a hard, long, good, day. Thanks to all of you who called, email or left posts on the blog. Next post I'll continue with a few more Tri-ing lessons and then I'll start a series on my sabbatical reflections. As I enjoy this last week of sabbatical, the Ironman reminded me again of how blessed I am to be part of a great community of people. I am looking forward to getting back to church and seeing my friends again. Ironman? We'll See, Won't We? Today is Ironman Canada. Three years ago, I would never have dreamt of even getting to the starting line. 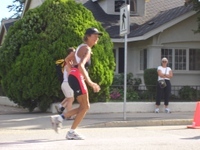 But today (Lord willing and with deep thanks to Ted, Charlie, Ernie--the master massage guru, Kristin at Wheenk, Paul and Steve at Cyclewerks San Clemente and, especially Beth and the kids) I am going swim 2.4 miles, bike 112 and then run a marathon until well after dark. It's going to be a long, hard, good day. If you'd like, you can follow the race at Ironmanlive.com I am number 1090 and will most likely be firmly, happily, near the rear all day. "Pack alot of life into living." Lessons from Tri-ing, Part 5: Underdo for maximum results. The “taper” period of training is all about letting the body heal from the heavy load that finished three weeks ago. Coming down from 20-25 hours of hard training to 40 minutes of easy “get the kinks out” pacing is for most triathletes that I know, pretty difficult. It takes discipline and determination, trust in your training program and the wisdom of coaches and experienced athletes who have come before. Along with a lot of long, hard intense workouts—and equally important—is rest. Indeed, that is how health is actually formed. In an earlier sabbatical post, I wrote about Bill Bowerman. 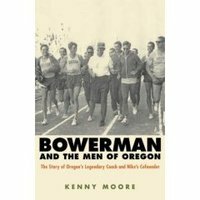 One of the books that I have been reading these past few weeks is a biography about this legendary track coach from the University of Oregon. Bowerman was to running, what John Wooden was to college basketball. Indeed, it was Bowerman’s genius that led to the modern running shoe, as he used his wife’s waffle iron to create the first wide waffle-soled shoe. He singlehandedly introduced America to a weird New Zealand practice called “jogging”. He was one of the co-founders of Nike. But Bowerman’s genius was in defying the conventional wisdom of the day and forcing, yes forcing his runners to have “easy days” and a far greater number of rest days. One of the things that I have learned from all of this training is the we don’t get stronger from work but from rest that follows work. It is the rhythm of work and rest, of stress and, yes, sabbath, of stretching and then relaxing, that leads to genuine long, term health and wholeness. Anything worth doing is also worth not doing for a while. And only in the rhythm of doing and “not doing”, together does a triathlete who loves the exercise…or a pastor who loves the ministry…find the stamina and strength for the long haul. Tomorrow is Ironman Canada. I am preparing for the day by continuing to post some lessons that I have learned along the way. 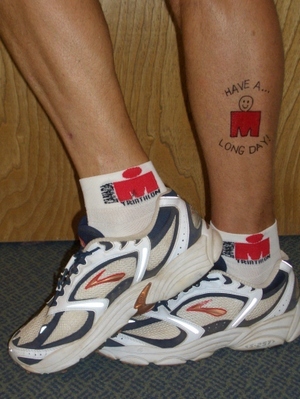 You can check back tomorrow and find out how it went by looking online at www.ironmanlive.com. Or on Monday, I'll post some results and reflections. The Ironman lore is all about sacrifice, dedication and courage. And in most people’s minds Ironman participants are looked at with both admiration and suspicion. (“You are going to do what?” they ask. “140 miles? In one day? You’re nuts!”) And indeed, there is a kind of blind leap of determination that is necessary for jumping in to one’s first triathlon. In fact, for some of us that is the defining decision: simply to try. We grab a swimsuit, a bike and some running shoes and determine to drag ourselves across the miles come hell or high water. But what is ironic is that a sport that is defined in the minds of so many by the agony etched in the face of Julie Moss stumbling across the line of Ironman Hawaii so many years ago, is really much more about the long, steady discipline of training, then the sheer determination of trying. It’s about putting in the time, rearranging your life to put in consistent, intentional, thoughtful hours over a long period of time that allows your body to adapt and prepare, to change, to become. It’s about “respecting the race” and dedicating yourself to not just doing something, but doing it well. To make your goal not just “getting out there”, but finding out what you’ve got and giving all you have. Training also includes a lot of learning, of practicing technique and mastering information. It’s not only about doing things harder, but also doing different things, or doing the same things better. Three years ago, when I just wanted to get into shape, I didn’t realize that there was so much to learn. I have relearned how to swim more efficiently, how to pedal a bike more effectively, and how to run so that I won’t get hurt. I have also learned what to eat and when, what to drink and how much, I have learned about heart rates and hydration, nutrition and recovery. The same lessons are true for my spiritual life, my marriage, my parenting strategies or the ways in which I lead our church, counsel and coach my team of leaders or disciple people. It’s not enough to simply try, I have to be trained and to train others. 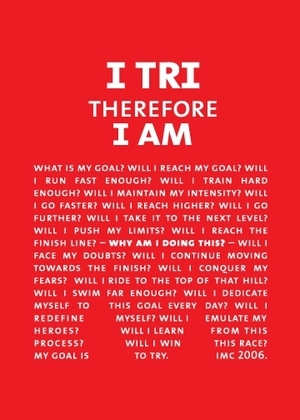 So here is the next lesson I learned from triathlon: Anything worth trying is worth training for. If a goal is worthy of being set, then it is worthy of the disciplined energy to slowly work toward it over a long period of time. To humbly learn what you need to accomplish the goal and to genuinely change. Training is about both learning and doing, it’s about becoming something different so that you can accomplish something you have been so far unable to do. Dallas Willard talks about spiritual disciplines as a kind of Christian training, of spiritual formation. And focusing on training reminds us that while it is important to be dedicated, committed and willing to endure a great deal, even more important is being willing to stop doing what doesn’t work and start doing what does. Or to put it another way: Training requires repentance. Whether it is the goal of losing weight, getting out of debt, finishing a degree, turning around a company, or being a better parent; determination, while important, will only get you so far. Trying, while admirable, is only a start. If it’s worth trying, it’s worth training. 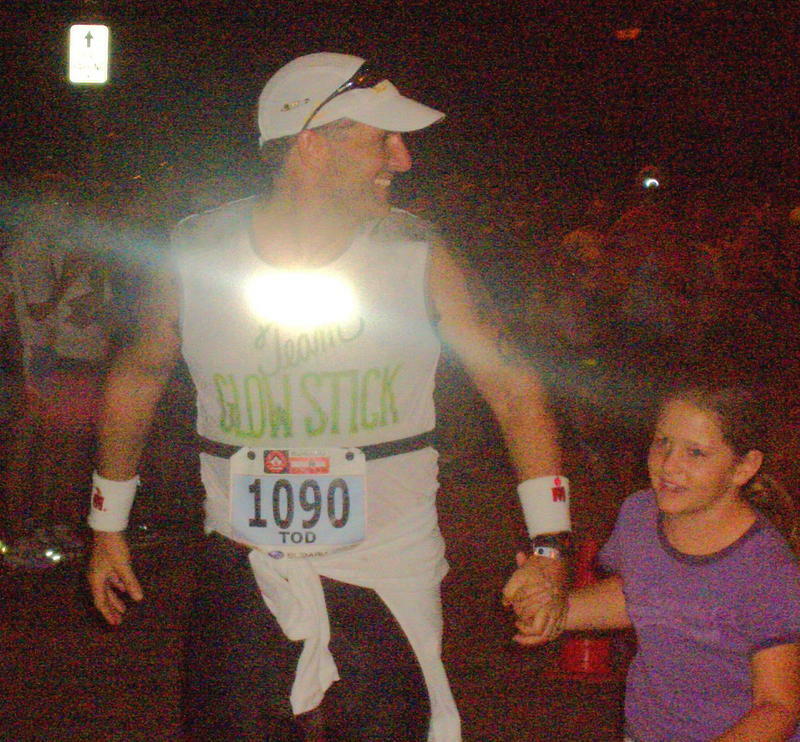 Lessons from Tri-ing, Part 3: TEAM Glow Stick. A year ago, Ted, Charlie and I traveled here to Penticton, B.C., to watch Ironman Canada 2005 and then get up very early in the morning to stand in line in the rain in order to sign up for the 2006 version. Now a year later we are back here, but this time with our wives and kids. All in all, our little party is ten strong; but only two, Charlie and I, will actually race. 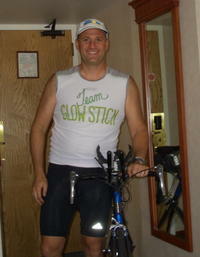 But together, we are a whimsical, tongue-in-cheek, but-oh-so-important team: “Team Glow Stick”. A team of friends, wives and kids cheering on two middle aged guys who doing something that makes most people just shake their heads. This is the beauty and irony of triathlon. While it is officially and technically an individual sport (and the rules are very strict prohibiting any on-course support, or any “drafting” on the bike) every triathlete will tell you that it’s virtually impossible to do one of these Ironman things alone. A family that understands the amount of hours that go into training and will allow the triathlete a certain amount of necessary self-absorption as the race nears, friends who will support, cheer, and encourage you along the way (like many of you reading this! ), training partners to get you out of bed for 6 hour training rides and three hour training runs (and make it much more fun), coaches (both virtual and literal) who teach you what to do, wear, eat, drink (and most importantly what NOT to), books, resources and websites, massage therapists and physical therapists, a huge crowd of race organizers and volunteers on race day and the throng of people cheering all day and into the night is not a luxury but a genuine necessity when you are stretching yourself so thin in pursuit of a goal. Anything worth doing is worth doing with other people. Certainly one COULD train, travel, and compete all alone. Indeed, one could skip the whole Ironman event hoopla and just get up one morning and swim, bike and run all the distances for a “do-it-yourself-Ironman”. But besides the obvious danger from going alone, something huge and very human gets missed: the shared experience. The reminder of our connectedness, the fact that we were created to go through life, and face challenges, in community. In my very first half-Ironman event two and half years ago, I traveled to the race sight by myself in the morning (I knew only one other person competing and he was in another heat so we didn’t see each other all day). I came out of the water disoriented and so tired that I already doubted whether I could finish the six-plus hours in front of me. But, as I got on my bike, and began to head out on to the 56 mile course, I heard a voice, “TOD, TOD. Go TOD!” I looked up and there was my friend, Al. 75 years old, gray hair, beaming face. He’d walked a mile to stand next to the route and waited about two hours to watch me zoom by in less than ten seconds. The burst of energy that I felt was only matched by the wave of emotion. Tears started streaming down my face and they didn’t stop all day. A few miles later I saw two members of my church waving to me; at a big bike turn, my wife and kids were holding up signs and cheering me on (my wife’s said, "#1228: You’re Hot! "—which of course was my number); later when I was on the run, my family, Ted and Charlie and Charlie's family and another friend from church all took a spot where they could watch me pass by four times, their cheers growing louder as my energy waned—providing the perfect pick me up. Just like (as someone once wrote) “it takes a church to raise a Christian”, it certainly takes a team to make a triathlete. Whether it is the “race” of life or the “race of a lifetime”, we are not meant to go it alone. Anything worth doing is worth doing with other people. Lessons from Tri-ing, Part 2: Go Glow. In Ironman, unless you are a professional or elite age grouper who is going to blister the 140.6 miles course in under 11 hours, then you will be required to put glow stick tape on your shirt as you go through the bike-run transition. If you happen to be out on the course as the sun goes down around 7 PM, the course officials will hand you a glow stick on a rope to hang around your neck or carry in your hand as you finish the run in the dark. It means that as the evening wears on and the myriad of “regular Joe” triathletes lumber home, it begins to look a little like a slow-motion version of the old Disneyland Electric light parade. Which leads to the second lesson I have learned from Tri-ing: Anything worth doing is worth doing slowly. When we think of running, or biking or swimming, it’s natural to think of doing these things FAST. We honor those who win races and break world records, but in actuality that is a very, very small number of people. And quite often because it seems impossible to win, or to accomplish something quickly, we don’t try at all. And in many ways in life, we unconsciously fall into the trap of thinking, "If I can't do it quickly, why do it?" Whether it is weight loss, trying to raise our children into good human beings, or making the world a better place, for so many of us, a most significant obstacle to accomplishing big or worthy things is impatience. Raised on television shows, we are convinced that most challenges can be met in 30 minutes to an hour. But if you want to become a triathlete, or run a marathon, learn a new language or make a difference in any significant way, the very first thing you are going to have to do is to slow down. Diligence, discipline and long-term commitment are far more important than speed. When exercising, most of us go out too fast and too hard, get hurt and feel lousy and then end up quitting something we have barely started. The best advice I can give to new runners is simple: Start walking. Walk until you feel like running and then run until you feel like walking (repeat). Soon you’ll be running farther—and faster—then you can imagine. Of course this applies to much more important things than swimming, biking and running. Want to learn what the Bible says? Start reading a chapter a day, slowly. Take it in. learn it. But just do it every day. Want to bring change to your church, or make a difference in the world like in places like Africa? It’s going to be a long race, so don’t start out too hard. Just keep at it. You have a lifetime to accomplish your goals. Think of your life as a big piece of granite and you have a tiny chisel. Just start chipping away. If it’s really worth doing, it’s worth doing slowly, so that you’ll keep at it long into night,"glowing" as you go, long after the sprinters have given up the race. As I enter into the last ten days or so of my sabbatical, I have one last “event” looming on the horizon. After traveling 27,000 miles by plane and car, reading a few thousand pages of books, spending a couple hundred hours reading and writing, and three months of fun, learning and family time, my sabbatical will end with a long, hard day and then a week-long rest. On Sunday, I will take part (I just can’t bring myself to write “race”) in Ironman Canada. For the better part of three years now, the three of us have been working out and hanging out together as a most unlikely trio of 200-pound, 40-something-year-old triathletes. While Charlie and I have never completed an Ironman-distance event yet, we do have several half-Ironmans and International distance races under our belts. We have also run a marathon, cycled a few centuries and, been able to do a few epic bike rides along the way. 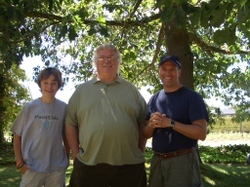 At the same time, I think we may have learned a few lessons that are in many ways connected to this whole sabbatical experience. Anything worth doing requires beginning humbly. 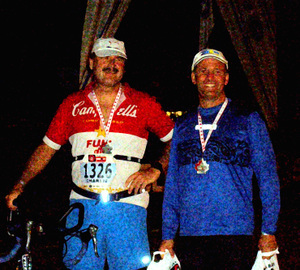 My Ironman journey began three years ago with a bad run, a big body and a little book. 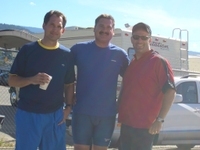 Three summers ago, my wife’s cousin Mike invited me to take a morning run with him while we were vacationing together in Sun Valley. Now, while I hadn’t run much in the prior months, I had been hiking and bike riding with my kids and I have always been somewhat of an athlete, so I figured a 3-mile morning jog was not beyond the realm of possibility. Running with Mike and stepping on the scale told me just how much I needed to make a change in my life, but the biggest obstacle was my strength…including my physical strength. I was captain of the wrestling team in high school, I have lifted weights and played sports and been physically active all my life. But beyond the physical, one of my biggest strengths professionally is that I can work quickly. I can write a sermon in one day if I have to, I can pound out memos and strategic plans, I am good at meeting deadlines. I am focused; I think on my feet and am good at attacking a problem. Also, at this stage of my life I know what I am good at and what I am not and, I can usually avoid those things that I can’t do very well. But following that fitness nadir in Sun Valley three years ago, Ted entered the picture and became both mentor and partner. Ted is built like me and he convinced me that if I really wanted to get into shape, triathlons are the perfect blend of cross-training and goal-oriented challenge to inspire. But it would mean that I would have to unlearn and relearn virtually everything I thought I knew and would make me humbly face all that I couldn’t do. Triathlon meant training long and slow, not quickly and intensely. It meant also meant having to humbly admit that I while I thought of myself as an “ex-jock” I didn’t know the first thing about life time fitness. While I could bench press more weight than ever before, I couldn’t swim 50 yards without stopping to rest at the half way point. Indeed, the first obstacle to my new goal was nothing more than the oldest human problem: pride. But that is where it started. Swallowing my pride, squeezing into a small suit, asking for help and awkwardly heading down the path that would change my life. The first lesson learned: Anything worth doing requires beginning humbly. Tomorrow: the main lesson and motto of “Team Glow Stick”.